Bottled maple syrup produced in Quebec. Maple syrup is a sweet syrup (thick, sticky solution of sugar and water) made by concentrating the sap of maple trees. In particular, maple syrup comes from the sap of the sugar maple or hard maple (Acer saccharum), but the black maple (Acer nigrum) and a few other maples can also produce maple syrup. Maple syrup is one of innumerable products that people obtain from plants that enhance the quality of their lives. Although maple syrup has some nutritional value, it is sought after by human beings largely because it stimulates the sensation of taste and enhances pleasure. It also is a product that can be obtained without lasting damage to the individual tree, as the holes bored into the wood to obtain the sap will heal if treated properly. Thus, the maple trees can continue to add to the human aesthetic joy of nature in other ways, including through their rich autumn foliage and by providing shade. Maple syrup is one of the oldest North American crops and one of the few that is uniquely North American (Saupe 2007; Willits 1958). The northeastern and north-central region of North America is the only region in the world where one can find both the sugar maple and the correct environmental conditions to yield the sap to produce maple syrup (Schlager 1994). Minnesota in the United States is the western edge for sugar maple trees (Saupe 2007). Maple syrup is a common sweetener used with pancakes, waffles, and French toast. It is sometimes used as an ingredient in baking or in the preparation of desserts. Sap is the fluid carried inside the xylem or phloem of a plant, circulating to distribute food and water to various parts of the plant. Although in vascular plants, the xylem is the principal water-transporting medium and the phloem is the main pathway of sugar transport, at times sugars do move in the xylem, and it is the xylem that is the source of the sugar to produce maple syrup. In late winter/early spring, producers of maple syrup tap trees and collect a sugary solution from the xylem, derived from carbohydrates stored in the stem. This is then concentrated to make maple syrup. At the time of harvest, the sap of maple trees contains sucrose and trace amounts of other sugars and oligosaccharides, calcium, potassium, phosphorus, iron, B vitamins, organic acids, amino acids, and about 90 percent water (Schlager 1994; Saupe 2007). The typical concentration of sucrose is about 2 to 3 percent, but can range from 0.5 to 10 percent (Saupe 2007; Kozlowski and Pallardy 1997). Sap flows in the early spring, usually February through April, and the flow requires cold nights (freezing) followed by warm days. The physiology of sap flow is still being elucidated. The flow of the sap in the xylem clearly is not related to evaporation from leaf surfaces, because the leaves are not yet out, and it is not related to root pressure (Saupe 2007; Johnson et al. 1987). The flow of sap in the dormant trees is related to positive pressures in the stem, with maximum yields when the wood temperature fluctuates above and below 0 degrees centigrade (Johnson et al. 1987). Sap flow appears to be related to gases in the xylem dissolving as the temperature cools and pressure decreases; water being drawn from adjacent cells; ice crystals forming in the xylem cells and intercellular spaces during the freeze cycle, locking the gases in the ice; and then with the thaw cycle, the ice melting and the compressed gases expanding and creating pressure (Saupe 2007; Johnson et al. 1987; Tyree 2001). For this process to happen, sucrose in the sap is required (Johnson et al. 1987). Carbon dioxide may be the main gas involved in creating the pressure, and both sucrose and living cells may be required for the cellular respiration that yields this gas (Saupe 2007). It appears that only a few trees meet the proper conditions for this phenomena, with the sugar maple (Acer saccharum) the preferred tree, the closely related black maple (Acer nigrum) having a lesser yield, and the red maple (Acer rubrum) and silver maple (Acer saccharinum) being used rarely (Schlager 1994). The red maple produces a less sugary and stronger tasting maple syrup. A sugar shack, where sap is boiled down to maple syrup. A method to produce maple syrup was revealed to French and British settlers by Native American tribes, such as the Algonquins. Today, Canada produces more than 80 percent of the world's maple syrup, yielding about 7 million gallons in 2003 and 2004, with over 90 percent of that coming from Quebec (NASS 2005). (Figures are in U.S. gallons. The Canadian imperial gallon times 1.20218 equals one U.S. gallon.) The Canadian province of Quebec is by far the world's largest producer, with about 75 percent of world production. The provinces of Ontario, Nova Scotia, and New Brunswick produce smaller amounts. Vermont is the biggest U.S. producer, with 410,000 gallons in 2005, followed by Maine (265,000), New York (222,000), and then a about a half-dozen other states with smaller industries (Ohio, Pennsylvania, Michigan, New Hampshire, Wisconsin, Massachusetts, and Connecticut). Production is concentrated in February, March, and April, depending on local weather conditions. To collect the sap, holes are bored into the maple trees and hollow tubes (taps, spouts, spiles) are inserted. Sap flows through the spouts into buckets or into plastic tubing. The traditional method is the hanging of a covered bucket or canvas bag from the spout to catch the sap and then collecting by hand. Modern use of plastic tubing with a partial vacuum, with sap flowing right into the production area, has enabled increased production. A hole must be drilled in a new location each year, as the old hole will produce sap for only one season due to the natural healing process of the tree, called walling-off. A single tap on a sugar maple will produce about 10 gallons (38 liters) of sap or about one quart of syrup (Saupe 2007; Schlager 1994). Schlager (1994) states that the holes are normally about one-half inch (1.3 centimeters) in diameter and 2.5 to 3 inches (6 to 8 centimeters) into the tree, but other reports are that contemporary producers use a 5/16 inch or 19/64 inch outside diameter drill bit to drill with, and a tap hole depth of 1 to 1 ½ inches as the common recommended depth. Trees from 12 to 15 inches in diameter support one tap and the number of taps can increase as the trees grow larger (Schlager 1994). After collection of the sap, it must be concentrated by removing much of the water content. To be considered maple syrup, it must reach a solution that contains 66.7 percent sugar or have a specific density of 66.5 degrees Brix or 36 degrees Baum (Saupe 2007). The process is slow, because most of the water has to boil out of the sap before it is the right density. It takes approximately 40 gallons of sap to make one gallon of maple syrup, although it may take only about 20 gallons during times when the sap is concentrated and up to 50 gallons when the sugar is more dilute (Herbst 1990). Production generally uses a continuous feed system, whereby sap is very slowly, but continuously fed through a series of channels in a long, shallow, heated (by fire below), stainless steel pan, where the sap is heated, concentrated, and the syrup is drawn off the opposite end from where it is fed into the pan. As the water is steamed off, the sap becomes concentrated and develops its characteristic flavor. Starting in the 1970s, some maple syrup producers started using reverse osmosis to remove water from sap before being further boiled down to syrup. The use of reverse osmosis allows approximately 75 to 80 percent of the water to be removed from the sap prior to boiling, reducing energy consumption and exposure of the syrup to high temperatures. Microbial contamination and degradation of the membranes has to be monitored. Maple syrup is sometimes boiled down further to make maple sugar, a hard candy usually sold in pressed blocks, and maple toffee. Intermediate levels of boiling can also be used to create various intermediate products, including maple cream (less hard and granular than maple sugar) and maple butter (creamy, with a consistency slightly less thick than peanut butter). A maple syrup production farm may be called a sugarbush or the sugarwoods. Sap is boiled in a "sugar house" or "sap house" (also known as a "sugar shack," or cabane à sucre), a building which is louvered at the top to vent the steam from the boiling maple sap. Maple syrup contains about 67 percent solids of which about 89 percent is sucrose; the remainder is primarily fructose and glucose, with traces of other sugars (MMSA 2007). It possesses some nutritional value, containing calcium (greater than milk, by volume), potassium (greater than bananas, by weight), manganese, magnesium, phosphorus, iron, and thiamine. It also contains traces of vitamins B2, B5, B6, riboflavin, biotin, and folic acid, and many amino acids and phenolic compounds (Morselli 1975). A serving that includes 50 milliliters of maple syrup contains the following recommended daily allowances: calcium 6 percent, iron 5 percent, manganese 2 percent, thiamine 6 percent, and riboflavin 2 percent (Jakeman 2007). Its caloric value is around 40 per tablespoon (15 ml), compared with 64 for honey and 60 for corn syrup. Grading standards are the same for most of the United States. Maple syrup is divided into two major grades: Grade A and Grade B. Grade A is further broken down into three subgrades: Grade A Light Amber (sometimes known as "Fancy"), Grade A Medium Amber, and Grade A Dark Amber. Grade B is darker than Grade A Dark Amber. The Vermont Agency of Agriculture Food and Markets uses a similar grading system of color and taste. The grade "Vermont Fancy" is similar in color and taste to U.S Grade A Light (Fancy). The Vermont grading system differs from the United States standards in maintaining a very slightly higher standard of product density. Vermont maple is boiled just a bit longer for a slightly thicker product. The ratio of number of gallons of sap to gallon of finished syrup is higher in Vermont. Maple syrup is sold by liquid volume, not by weight; however, a gallon of Vermont Grade A Medium Amber weighs slightly more than a gallon of U.S. Grade A Medium Amber. The Vermont-graded product has one-half percent more solids and less water in its composition. In Canada, there are three grades containing several color classes, ranging from Canada #1, including Extra Light (sometimes known as AA), Light (A), and Medium (B); through #2, Amber (C); and finally #3, Dark (D). A typical year's yield will include about 25 to 30 percent of each of the #1 colors, 10 percent Amber, and 2 percent Dark. Extra light syrups are recommended for making maple sugar candy, on pancakes, and waffles; Light for French toast, desserts, and cereals; Medium for glazing, sweetening, or eating on its own. Number 2 grade syrups are intended for baking and flavoring. In addition, Canada #2 Amber may be labeled Ontario Amber for farm sales in that province only. Number 3 grade syrup is heavy, and restricted for use in commercial flavorings. A non-table grade of syrup called "commercial," or Grade C is also produced. This is very dark, with a very strong flavor. Commercial maple syrup is generally used as a flavoring agent in other products. The grades roughly correspond to what point in the season the syrup was made. U.S. Grade A Light Amber and Canada #1 Extra Light is early season syrup, while U.S. Grade B and Canada #2 and #3 is late season syrup. Typically Grade A (especially Grade A Light Amber) and #1 Extra Light has a milder, more delicate flavor than Grade B or #3, which is very dark with a robust flavor. The dark grades of syrup are primarily used for cooking and baking. Sometimes off-flavors are found in maple syrup. While this is more common toward the end of the season in the production of commercial grade product, it may also be present early in the season during the production of U.S. Grade A Light or Canada #1 grade. Identification of off-flavor in table grades is cause for ceasing production and either dumping the product or reclassifying the product as commercial grade if the off-flavor is slight. Off-flavors are described as: metabolism, derived from metabolic changes in the tree as spring arrives and having either a woody, popcorn, or sometimes peanut butter-like flavor; buddy, referring to the swelling of the new buds and its impact on the flavor and having a bitter chocolate or burnt flavor; and ferment, an off-taste caused by fermentation and having a honey or fruity flavor, often accompanied by surface foam. Additionally, if trees are stressed or fighting off disease or insects (e.g. gypsy moths), they will produce a folic-like acid causing a bad taste. After an ice storm, trees may also produce the same acid. 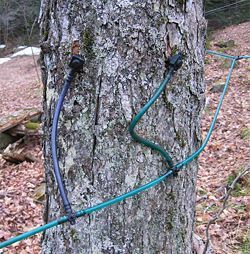 Two taps in a maple tree, using plastic tubing for sap collection. Maple syrup and its artificial imitations are the preferred toppings for crêpes, pancakes, waffles, and French toast in North America. Maple syrup can also be used for a variety of uses, including: biscuits, fresh donuts, fried dough, fritters, ice cream, hot cereal, and fresh fruit (especially grapefruit). It is also used as sweetener for applesauce, baked beans, candied sweet potatoes, winter squash, cakes, pies, breads, fudge and other candy, milkshakes, tea, coffee, and hot toddys. Maple syrup and maple sugar were used during the American Civil War and by abolitionists in the years prior to the war, because most cane sugar and molasses was produced by Southern slaves. In New England, Quebec, and eastern Ontario, the process has become part of the culture. One tradition is going to sugar houses (cabanes à sucre) in early spring for meals served with maple syrup-based products, especially the dish known variously as maple taffee (in English Canada), Tire sur la neige (in Quebec), and sugar on snow (in the United States). This is thickened hot syrup poured onto fresh snow and then eaten off sticks as it quickly cools. This thick maple syrup-based candy is served with yeast-risen doughnuts, sour dill pickles, and coffee. Owing to the sugar maple tree's predominance in southeastern Canada (where European settlement of what would become Canada began), its leaf has come to symbolize the country, and is depicted on its flag. Several U.S. states, including New York and Vermont, have the sugar maple as their state tree. A scene of sap collection is depicted on the Vermont state quarter. Many "maple-flavored syrup" products are imitations (table syrups), which are less expensive than real maple syrup. Often sold in the United States, the primary ingredient is most often dark corn syrup flavored with sotolon, with little (2 to 3 percent) or no real maple syrup content. They are usually thickened far beyond the viscosity of real maple syrup. Since U.S. labeling laws prohibit these products from being labeled "maple syrup," many manufacturers simply call the imitation "syrup" or "pancake syrup." 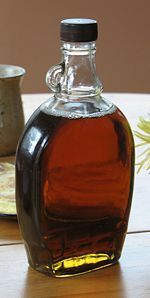 Québécois sometimes refer to imitation maple syrup as sirop de poteau ("pole syrup"), a joke referring to the syrup as having been made by tapping telephone poles. Herbst, S. T. 2001. The New Food Lover's Companion: Comprehensive Definitions of Nearly 6,000 Food, Drink, and Culinary Terms; Barron's Cooking Guide, 3rd ed. Hauppauge, NY: Barron's Educational Series. ISBN 0764112589. Jakeman's. 2007. Maple Facts. Jakeman's Maple Syrup. Retrieved May 4, 2007. Johnson, R. W., M. T. Tyree, and M. A. Dixon. 1987. A Requirement for Sucrose in Xylem Sap Flow from Dormant Maple Trees. Plant Physiol 84: 495–500. Michigan Maple Syrup Association (MMSA). 2007. Nutritional Value of Pure Maple Syrup. Information Facts and Figures. Retrieved May 4, 2007. Morselli, M. F. 1975. Nutritional Value of Pure Maple Syrup. Maple Syrup Digest 14(2): 12. National Agricultural Statistics Service (NASS), United States Department of Agriculture. 2005. 2005 New England Maple Syrup Survey. New England Agricultrual Statistics. Retrieved May 4, 2007. Saupe, S. G. 2007. Biology of Maple Sap Flow. College of St. Benedict/St. John's University. Retrieved May 4, 2007. Willits, C. O. 1958. Maple-Syrup Producers Manual. United States Department of Agriculture Handbook 134. This page was last modified on 16 September 2014, at 17:19.